As we all know, I don't really do baking...but when I DO, I generally decide to make something absurd. Because really, if I'm going to challenge myself, I might as well go big as opposed to solely stressing myself out with just having to specifically measure things (read: I do not like doing this). Anyway, it's that time of year when all I'm thinking about is food....wait, that's everyday. Ok, let's reword this - Thanksgiving time I think a little more strategically about food. We all know it is UTTERLY important to have the closest thing to a Normal Rockwell-esque Thanksgiving as humanly possibly, so basically that means... MAKE IT NICE. And what better to make it nice than a rose apple tart? A pastry chef to make it for you, that's what. But where's the fun in that? Nowhere to be found. So, roll up your sleeves and get ready for baking! A few notes - you can definitely use pre-made pie/tart dough, but let's be honest, it's more exciting to just make it yourself? The pate brisee needs to chill for at least an hour, so factor that in when you're making it. ALSO! 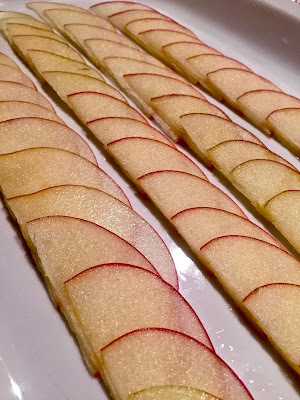 This recipe is made with a walnut cream - you could use frangipane (which I'll be trying next), even some kind of jam, or just omit completely if you want straight up apple flavor! This recipe really is open to variation, so have fun with it! In a food processor, process all of the dry ingredients until mixed, just a few seconds. Next, add the butter and press until the mixture becomes coarse and crumbly. With the mixer running, slowly stream in 1/4 cup of ice water. If the mixture is still too crumbly, continue adding water until the mixture can be squeezed together into dough - just make sure it's not wet and sticky. Separate the dough into two balls, flatten into discs, and wrap with plastic wrap. Place in the refrigerator for at least one hour. Mind you, this recipe makes quite a bit of pate brisee - you can make a variety of pies and tarts with it, and the dough can even be frozen for up to a month! I made one 8-in tart and still had over half of the brisee left to use. Half the recipe if you don't want as much. In a food processor, place the walnuts, sugar, flour, and cinnamon - process until all chunks are ground and the mixture is finely ground. In a mixing bowl, beat the butter until creamy. Add about half of the walnut mixture and beat to combine. Next add the egg and remaining nut mixture, and beat together until all is incorporated. Finally, add the vanilla, mix, and refrigerate until about 10 minute before assembling. Remove the dough from the refrigerator and allow to "warm up" so it becomes pliable enough to roll out. Lightly butter your tart pan, and place a parchment paper disc (also buttered) on the bottom. On a lightly floured surface, roll out the dough until it's about 1/2cm thick, slowly drape over the tart pan and press into the edges, pressing any air out. Pinch together and remove any excess dough. Prick the bottom of the tart with the tines of a fork. Make a small base out of aluminum foil inside the tart and fill with the beans or pie weights - this ensures the dough doesn't puff up. Cook for 5 minutes at 425F, then reduce heat to 350F and cook for another 20 minutes. Remove from oven, remove beans, and let cool. Alright - here we go! This is where the fun begins, and amounts start getting a little less specific. Variation occurs because all apples aren't the same size, and you may need more or less depending on the thickness of your apple slices. If you have a mandolin (one of my favorite kitchen contraptions), now is the time to bust it out! I sliced mine paper thin, about 1-1.5 mm. If you don't have a mandolin, just slice as thinly as possible! When prepping the apples for a recipe like this (necessitates flat edges and uniformity), I don't cut it right into quarters and slice out the core. Instead, I slice straight around the core, leaving me with a rectangular center to throw away (or compost?). This is your best bet to get the straight edge needed to make the 'roses'. When slicing the apples, you want to place them in acidulated water to prevent browning. Acidulated...read: lemon water. Just mix the lemon juice in with your water and voila! Apples stay crisp and bright. 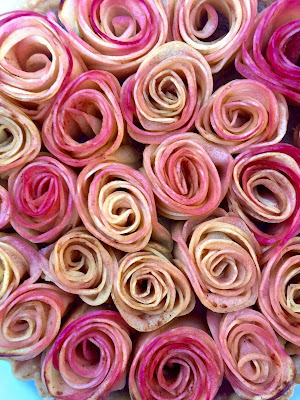 Now for the fun part - making the roses! This is probably the most 'labor intensive' part of the recipe, but I think it's pretty fun and super easy too! Toss together the sugar and cinnamon in a bowl and set aside. I'm a little OCD and didn't want my roses to unravel, so I had some ramekins and little bowls around to pack them in. (which I realized, after taking a step back, that I look like a crazed lunatic in the kitchen, but whatevs). Take some of the apple slices out of the water and place on paper towel to dry a little bit. 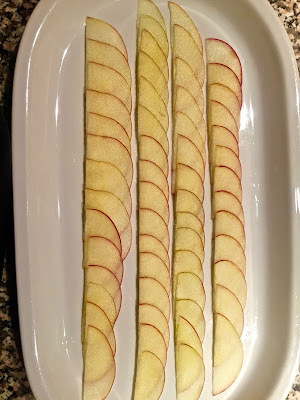 Make straight rows of apple slices, overlapping one another, on the baking sheet. My rows were probably about a foot in length - obviously, length dictates what the final size of the rose will be in diameter. Sprinkle each row with a good amount of the cinnamon sugar mixture. 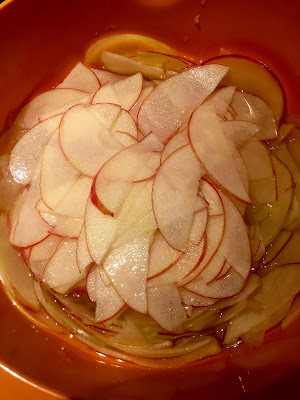 Place in the oven until the apples are soft/pliable enough to roll and not snap in half - again, the time depends on how thick your apple slices are, so check every so often. To expedite the process, you can also use a microwave and zap em in about 15 second intervals (if you're doing this, you don't need to have the oven on yet). Microwaves confuse me. Get rolling! Start from the left end and slowly start to roll - once you've started DO NOT STOP until you've reached the end! 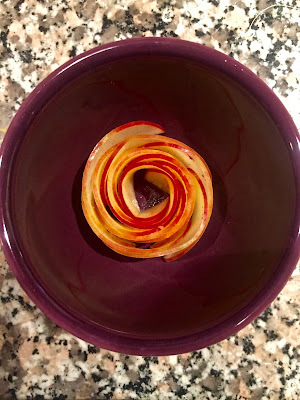 Slowly pick up and place into a tiny bowl that can contain the rose. Repeat with the remaining rows, and pack the roses together so they don't unravel. Repeat, repeat, repeat, until all of your apples are gone. My tart used 24 roses - it's better to have more than less! 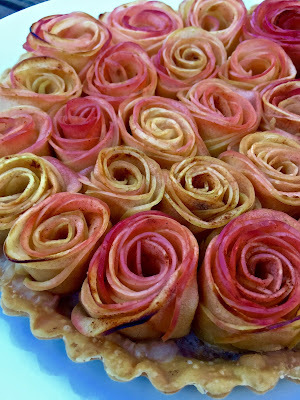 I find it easier to have all of your roses rolled before placing them in the tart. TO ASSEMBLE!! Remove the walnut cream from the fridge about ten minutes before you fully want to put the tart together. Make sure your oven is as 350F at this point. With an offset spatula, spread a thin layer of the cream on the bottom of the tart - about a centimeter thick or so. Since this has egg in it, it will puff up a little bit. The cream also helps to anchor the apples in the tart as well. Start from the outside in and start placing your roses! 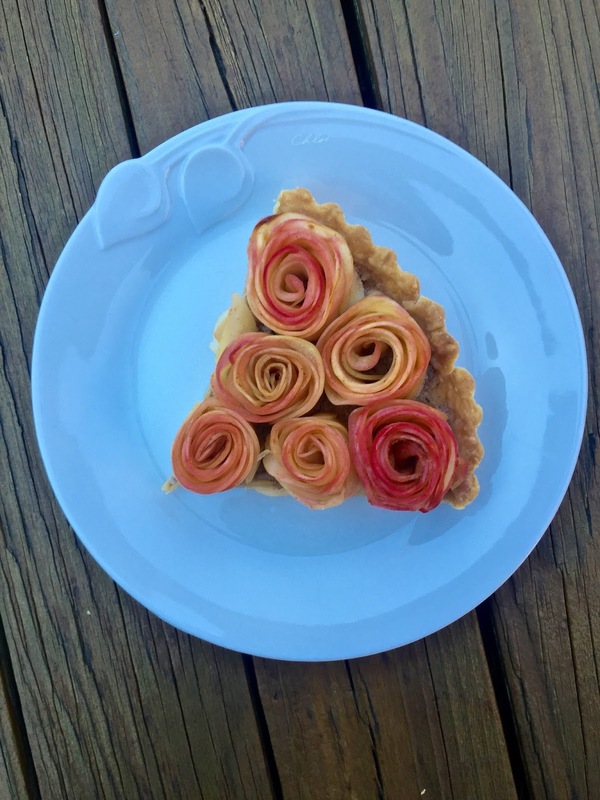 Don't worry about squeezing them together, make sure their packed in there so the tart holds form. Sprinkle the entire tart will cinnamon sugar. 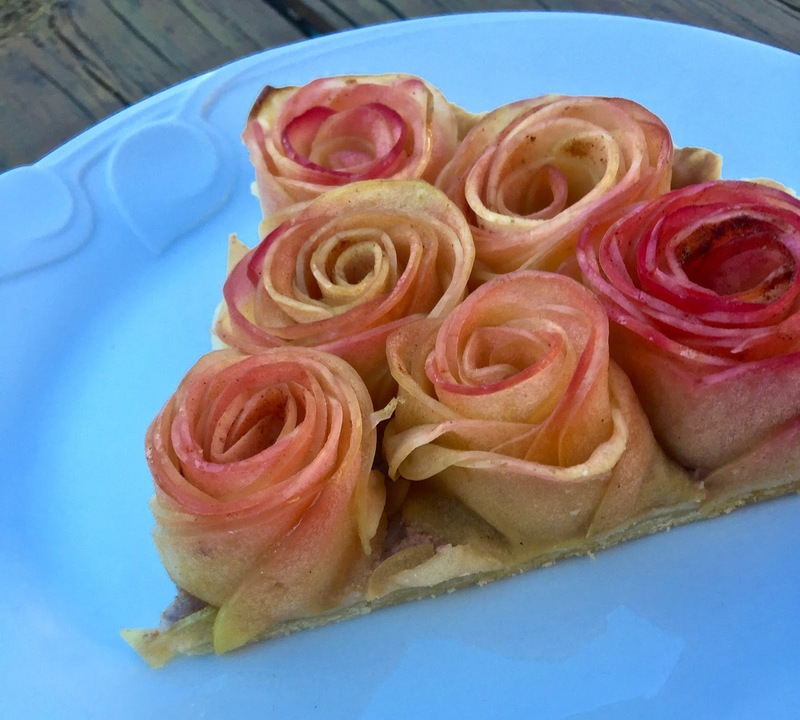 If you're so inclined, you can place a small dot of butter in the center of each rose. Place in the oven and cook for 30 minutes. Again, you may need to adjust depending on thickness of your apples, but by this point you should be good to go. 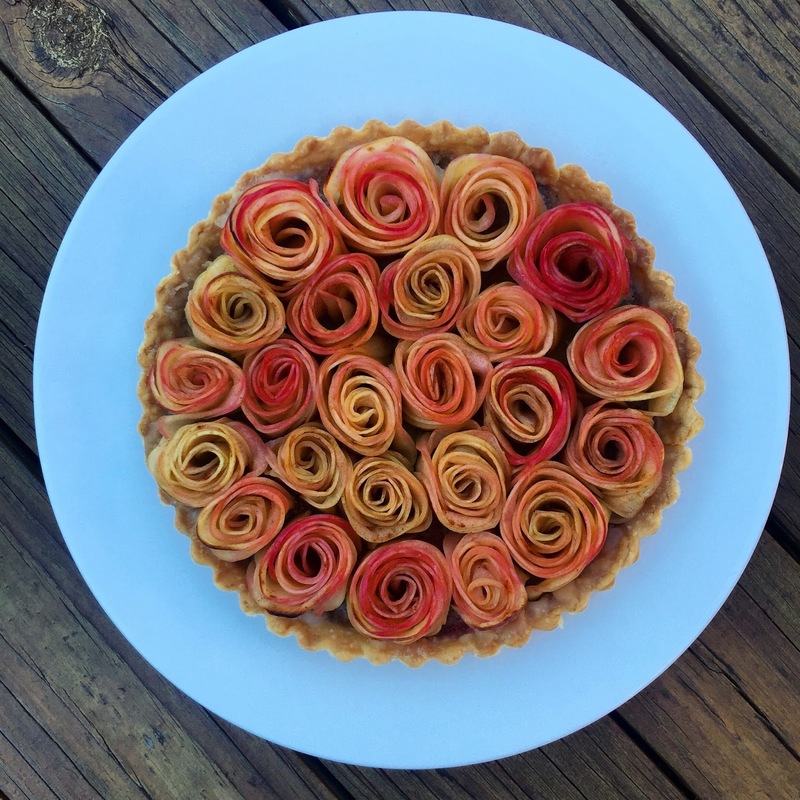 When my tart was done, I brushed the top with a mixture of rose syrup and orange blossom water (because yes, I casually have that laying around the house) and placed back in the oven for a couple minutes. Not a necessary step but I wanted to add a bit of a floral element to it. Let cool a bit and EAT!! This is delicious on it's lonesome, but also great with some french vanilla (or cinnamon!) ice cream. Round two I may be making an apple juice/cider reduction/glaze to drizzle over the top of this pie to amplify the apple flavor. Not only was this delicious ...... It's so beautiful! This article is an appealing wealth of informative data that is interesting and well-written. I commend your hard work on this and thank you for this Medex supply coupons information. You’ve got what it takes to get attention. Wonderful blog. thanks. You're my ideal person. IDM Crack is straightforward and easy to use down-loader and endless of people have mounted this program because of its straightforwardness alongside its own particular 5x speedier rate. You're intended for heightening the rate. You can down load the motion pictures out of wherever from by utilizing this particular magnificent program including downloading the video cuts out of face-book, Vimeo, Dailymotion, YouTube or an alternate video website. In this occasion, we should supply the association which you might want to get into, in spite of the fact that the instrument with the program is the way that we're ready to get into the motion pictures . IDM could be your whole number one down loader which empowers a person to get into the video cuts with achievement with all the UI.